Situated in the heart of Princeville on the renowned Makai Golf Course, this luxury vacation rental with Bali Hai and ocean views offers ample space to comfortably accommodate eight guests. 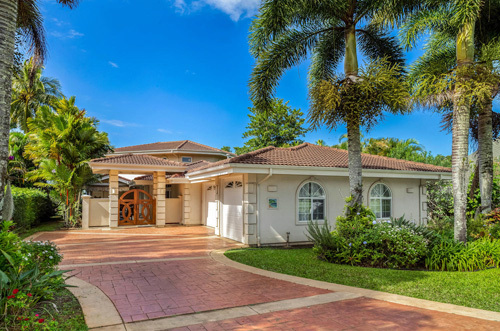 Complete with a private pool and air conditioning throughout, the home allows convenient access to gorgeous beaches, exceptional golf, and numerous dining and shopping options. Three large bedrooms at Ohana Kamalani feature king beds and en suite bathrooms, while an additional room comes furnished with bunk beds. Upstairs, guests will find a bright and spacious, beautifully appointed kitchen with fine finishes, plenty of counter space, and a large island with bar seating. The kitchen flows seamlessly into an indoor dining space for eight, which in turn transitions into an expansive, open living space with plenty of inviting seating.